The decision about whether to receive systemic adjuvant therapy for cancer depends on weighing the benefit (in terms of increased relapse-free or overall survival) against the cost and risk with such therapy. As the use of adjuvant therapy has been extended into node-negative breast cancer, the decisions have become less obvious because the benefit is smaller, particularly as compared with the risks associated with the therapy and nonbreast cancer mortality. Guidelines can be helpful in these situations, but a limitation of guidelines is that they usually are compendiums of expert opinion and provide little quantitative guidance. In addition, it can be difficult to state guidelines that can be patient specific when multiple parameters might be used in the decision (e.g. age, comorbidity state, actual number of nodes, tumor size, hormone receptor status, histologic grade, and additional pathologic laboratory evidence). To address this problem the decision tool Adjuvant! (Fig. 1) was created [1, 2]. 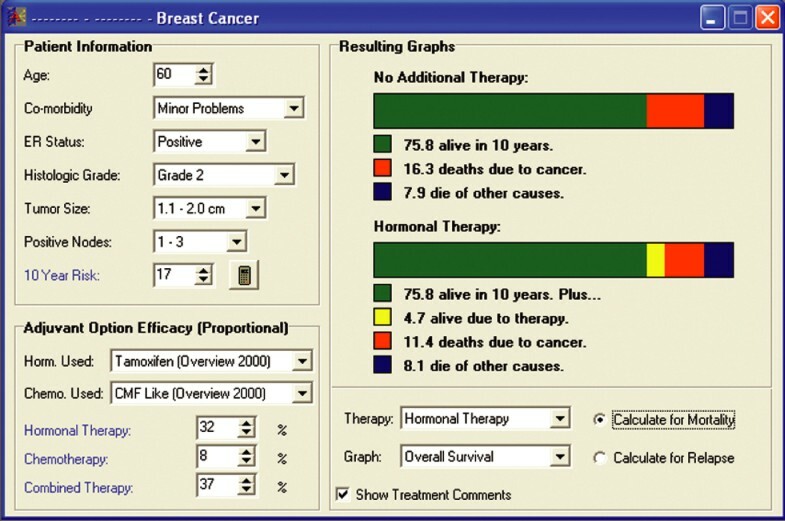 It uses data from national databases and other sources to make estimates of a patient's baseline prognoses. It uses data from the Overview, and individual clinical trials to make estimates of treatment efficacy. It uses national data about age-specific competing mortality to make estimates of competing mortality. Although the program provides these estimates, it has the flexibility to allow the user to modify the estimates as they think appropriate. Over 200 pages of help files allow the user to review the data on which the program is based, and the methods used by the program and the assumptions which it makes. That for the most part these estimates are reasonable is supported by a validation of Adjuvant! 's estimates in a large independent database . Specific sheets describing the toxicity and safety issues of different adjuvant treatment options are included. The presentation will discuss the strengths and limitations of this approach. 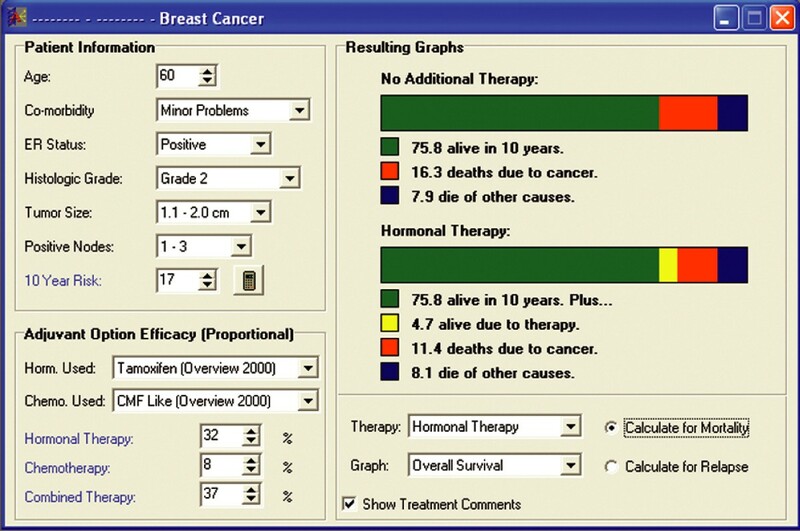 The major strength is that this tool allows the doctor and patient to review in a quantitative sense the benefits and risk of different options. The limitations are that for many therapies we have limited knowledge about their long-term efficacy (and Adjuvant! makes specific assumptions to deal with this), and undoubtedly we will learn more about how some tumors' characters may affect their sensitivity to therapy. How new prognostic factors and genomic information may be included will be discussed.